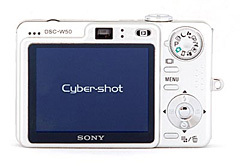 Hobbyists looking for a solid 6-megapixel pocketable digicam for less than $250 might want to take a look at the recent review of the Sony Cyber-shot DSC-W50 published on Imaging-Resource.com. In addition to its ample resolution, the DSC-W50 sports a 3X optical zoom, 2.5" LCD monitor, fast shutter response, fun multi-burst mode, great battery life, fast USB 2.0 interface, and cool accessories such as an underwater case. The DSC-W50 also features high ISO settings up to 1000, but before you get you hopes up that you have a low-light gem here, read what Imaging Resource says about picture quality at settings above ISO 400. Their opinion is that print quality is unacceptable at these high settings, but very good at 400 or below. Overall, seems like a great camera to toss in the pocket and hit the road.